Sturdy and durable, the California fleece zip jogger by American Apparel provides comfort and warmth. Extra thick and breathable, the jogger can be worn for any outdoor activity. Customize to make it your own! 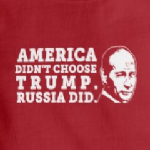 America Didn't Choose Trump, Russia Did.